– Winston Churchill, in 1911 shortly after he was appointed First Lord of the Admiralty. While many rightfully honor Winston Churchill for his leadership role in the Second World War, history has a way of idolizing his character, overlooking not so glorious decisions he made on his path to success. In spite of his words at his appointment as first lord of the admiralty 3 years before the first world war (as quoted above) Churchill made the gruesome mistake of the Gallipoli disaster, leading thousands of allied soldiers to a gruesome and seemingly unnecessary death. One of them was Edward McKarley, great-uncle to Tom McKerley, co-author of Bloodlines – Touch Not the Cat. 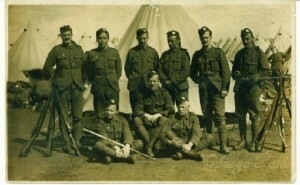 The Gallipoli gravenumber of Alexander Stewart, No. 328, as mentioned on page 251 of part I of the genealogy mystery series, is in fact where Tom’s ancestor found his last resting place. Edward was born in 1885 as third child of six, in Airdrie, an industrial town in Central Scotland. His father John worked in the ‘Tube Works’ and the family lived in a street called, ‘Wellwynd’. In 1907, Edward at the age of 22 married a Jeanie Kane, also 22. Like his father he worked in the ‘Tube Works’ and Jeanie was a weaver. They went on to have two children, John, born in 1911 and James, born in 1913. Edward enlisted to fight in World War I and was a sapper; a combat engineer in the Royal Engineers. He was killed in Gallipoli on 6th September, 1915. His deathcertificate states: cause of death, “died of wounds”. At the time Jeanie was pregnant and later gave birth to a daughter, named Edwardina. While researching his family tree and in particular the death of the ‘Gallipoli McKarley” Tom McKerley often wondered about the precise circumstances and location of Edward’s death. As 2014 sees the 100th anniversary of the start of the Great War, it seemed appropriate to bring Alexander back to life in Bloodlines – Traces, part II of the series, and articulate the conditions and events in which Edward McKarley perished. Even though the Traces storyline may be far removed from the way McKarley died; it did give Tom Mckerley a chance to visualize the circumstances, with Alexander exposing the mistakes Churchill made that led to the death of tens of thousands of troops. Here is a brief account of what happened in Gallipoli. In October 1911 Winston Churchill was made First Lord of the Admiralty, which he was to remain till May 1915. On 25th November 1914, he presented his plan to create a new war front in the Dardanelles to the British government’s War Council. Rather amazing given his profound comments in 1911. On 15th January1915, the War Council gave its agreement and British troops in Egypt were put on alert. The Central Powers were fighting primarily on two fronts – the Western and Eastern Fronts. Fighting against such armies as the Russian and French armies put a great deal of strain on the German military. The Gallipoli Campaign (Battle of Gallipoli) however was to be one of the Allies great disasters. Carried out between 25th April 1915 and 9th January 1916 on the Gallipoli peninsula in the Ottoman Empire, the doomed campaign was to position a new war front that the Ottomans could not cope with. Churchill’s intention was to cut the war short and hence save lives. His idea was simple. Creating another front would force the Germans to split their army still further as they would need to support the badly rated Turkish army. When the Germans went to assist the Turks, that would leave their lines weakened in the west or east and lead to greater mobility there as the Allies would have a weakened army to fight against. The Turks had joined the Central Powers in November 1914 and they were seen by Churchill as being the weak underbelly of those who fought against the Allies. The turkish army input into the Gallipoli campaign was a disaster. It would appear that the senior commanders on the ground believed that their opposition simply was not up to the standards of the British and ANZAC troops. On April 25th, the ANZAC’s landed at Anzac Cove. Here they were faced with steep cliffs which they had to climb to get off the beach. To make matters worse, Anzac Cove was a tiny beach and quickly became very congested. The Turks, led by the unknown Colonel Mustapha Kemel, pushed back the initial ANZAC move inland. The fighting was bloody and costly, yet when Lieutenant-General Birdwood of the British troops asked his boss Hamilton for permission to withdraw, Hamilton refused. The landing at Helles, a second location of invasion, was more successful, yet by May the Allies had lost 20,000 men out of 70,000. Six thousand had been killed. The medical facilities were completely overwhelmed by the casualties. Trench warfare occurred along with the fear of dysentery and the impact of the heat. The next phase of the battle started in August. Hamilton ordered an attack on Suvla Bay that was not heavily defended. The landing took place on August 6th and involved the landing of 63,000 Allied troops. This time the secrecy behind the operation was so complete that senior officers were unaware of what others were doing. These 63,000 men were meant to take the area around Suvla Bay and then link up with the ANZAC’s at Anzac Cove. The plan very nearly worked but the ANZAC’s could not break out of Anzac Cove. The British at Suvla were pushed back by a frantic attack led by Mustapha Kemal and by August 10th, the Turks had retaken Suvla Bay. Hamilton was recalled and he was replaced by Sir Charles Monro, who recommended evacuation. This task was given to Birdwood. The evacuation of Suvla Bay and Anzac Cove was a brilliant success. It was accomplished on December 19th to December 20th. Not one casualty occurred. The evacuation of Helles occurred on January 8th to January 9th, again with no loss of life. Thus the campaign ended with two successes, yet the overall campaign was a disaster of the first order. Over 200,000 Allied casualties occurred with many deaths coming from disease. The number of Turkish deaths is not clear but it is generally accepted that they were over 200,000. Churchill was to pay the price for the bloody failure of the Dardanelles campaign. He was dismissed from his post at the Admiralty and made Chancellor of the Duchy of Lancaster. Having been Home Secretary and First Lord at the Admiralty, this was seen by many, including Winston Churchill, to be a demotion. He left the post after just six months to rejoin the army. Edward McKerley was my Grandfather. Looking forward to reading the book.